It's gorgeous right now. The sun came out an hour ago and I love how clear everything looks. It's like it was outlined. Yes, that's a lot of snow. On Monday, we were informed there would be a "small" weather system moving through the Chicago area. The snow would start around 6 p.m. 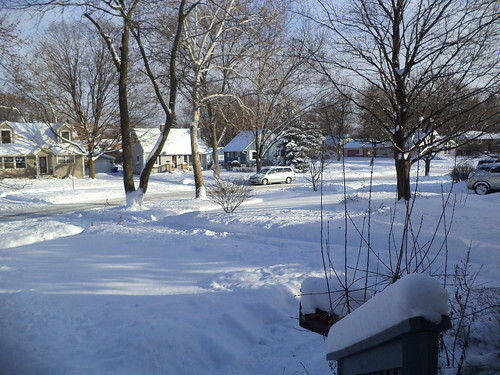 If you lived north, near Wisconsin, you could expect to see around 5 inches of snow. If you lived in the middle, where I live, there would be about 3 inches coming. I guess I should have realized on Tuesday, that this wasn't going to be what was predicted when it started snowing at 2; really snowing, the kind of snow fall that makes everything look like you're viewing it through waxed paper. I tried to stay somewhat on top of it. It was very dry snow. You cannot make snowballs or forts or men with this. 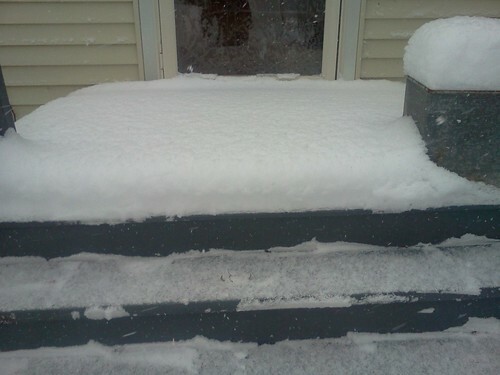 So, all New Year's Eve and throughout New Year's Day, I would go out and sweep the snow off the deck. The shovels, which sit by the back door, weren't needed. It was so light, I just used the broom. But, it never stopped coming, all day. I'd grab the boom whenever I was in the kitchen and go sweep. I couldn't tolerate being outside in just my slippers and street clothes so I never completely swept off the deck. 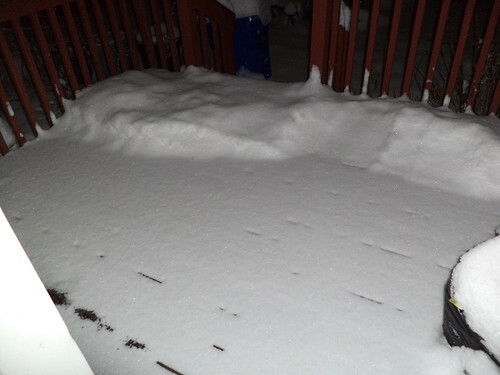 I swept the deck at 9 p.m. and, at 11 p.m., when I was getting ready for bed, it was covered again. The humpy pile at the upper left corner is where the birdbath is. 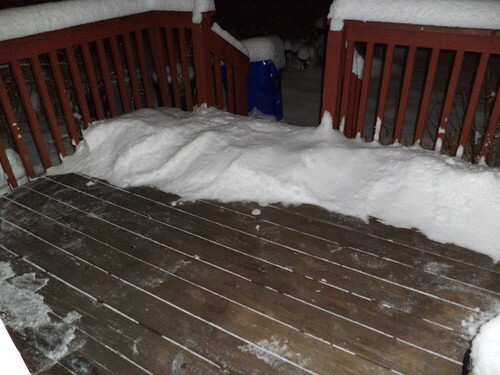 It wasn't snowing much at 11 p.m., so I gave the deck another sweep and went to bed. Well, this is more than 3 inches, but, because it's lightweight, I'll be able to head out the driveway in the morning and deal with it when I get home. 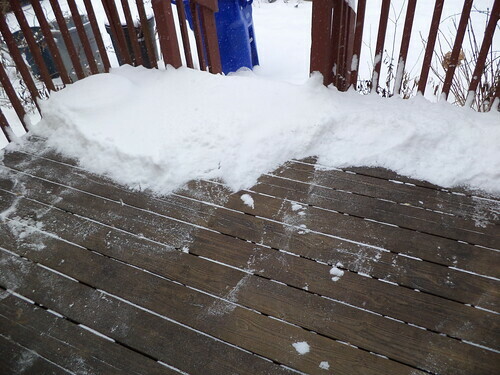 Imagine my consternation when I awoke and saw the amount of snow on the deck was double what I'd swept up. I started shoveling right after eating some breakfast, but I realized that there was more than I was going to be able to handle in an hour. 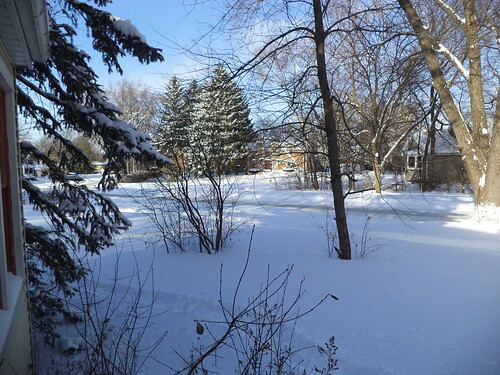 The temperatures are to tank here overnight so I didn't want to let the lack of paths sit and have to try to shovel in worse cold so I took today off. Ironically, at the beginning of December, I considered taking today and tomorrow off. I have the days to use up, but we are so busy, I didn't feel I could. Mother Nature made sure I got a snow day. I have to go slow. I'm just slower than others, even with powdery white stuff. This is not a race to see who can clear the drive quickly. This is just to liberate things, like the Jeep, so I can carry on with life. It's quite pretty out, even when it's snowing buckets and you have to move this stuff from one section to another. 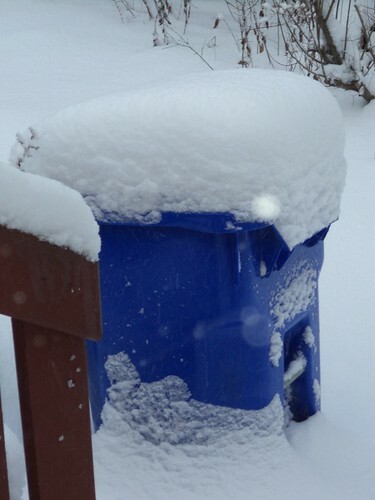 The recycling can is a good indicator of depth. 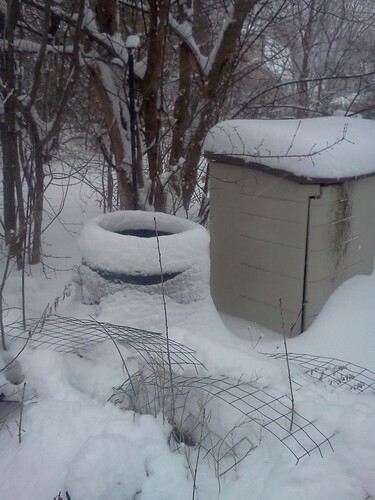 I like the ring on the top of the compost bin. I should try to find the lid for this thing, but I know the squirrels love it when I toss seeds into the bin. 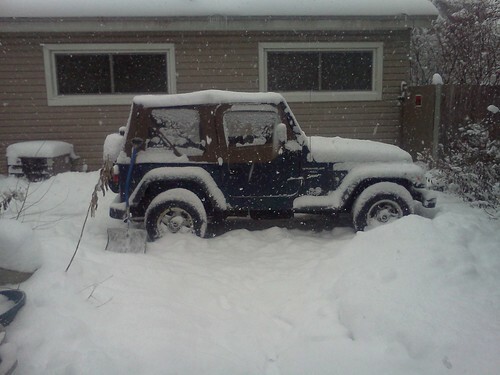 I shoveled to the Jeep and got that swept off and dug out. Dug out is kind of a misnomer. With the snow being so light, it's easy to just shove it out of the way. But there's a foot of it out there so I did have to scoop and throw, scoop and throw. 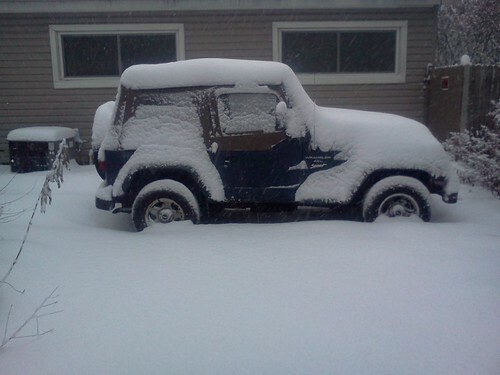 Once I got the Jeep cleared off, I looked down the drive and felt tired. That yellow bit to the left is my glove. I was using my cell phone camera at this point as the other camera's battery had died, of course. I decided this was as much as I would do at that time. I needed to rest and not overdo it. A nap with Pilchard and I was refreshed to tackle the next phase, the front. My plan was just shoveling two tracks down the drive to the apron, eventually, in the afternoon, shoveling the apron. This next phase would shovel past the house, create a path for the mailman by the mailbox, shovel the front steps and part of the front walk. 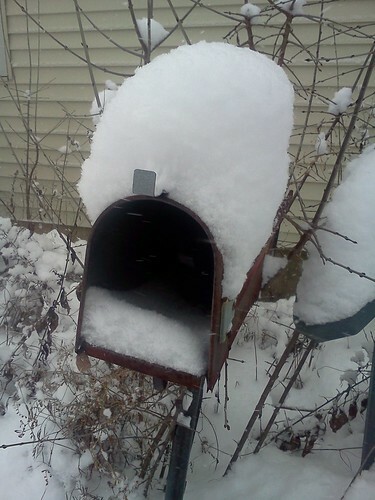 I need a new mailbox, but I've said that for several years now. Thankfully, I can just shove this snow to the left or right. 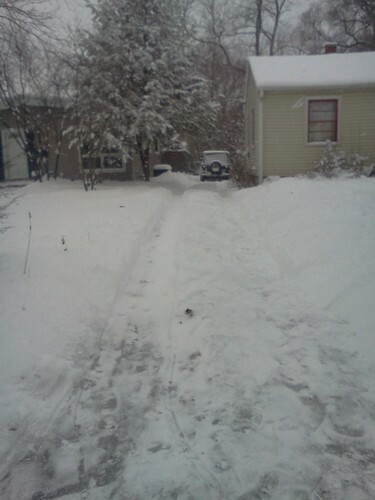 I felt good so I started shoveling one tire track to the street. My neighbor, from across the street, came over with his snowblower and offered to help. He blew out the driveway apron and widened the sidewalk from my one shovel width to one and a half. 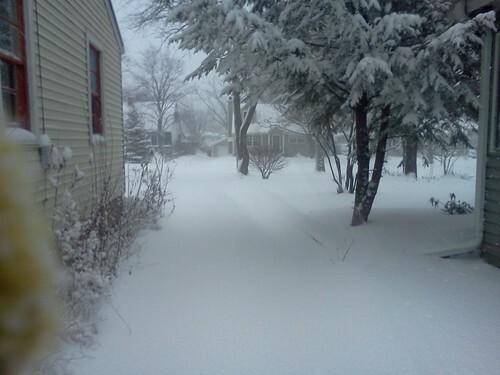 I shoveled the other wheel track and the front walk and I was done, at noon. I repositioned the Jeep so I can drive forward in the morning and I'm good. This went so much faster than the great blizzard of February 2011, when I didn't get out until Sunday evening. Mercifully, it's not to be windy so none of this light, powdery stuff will blow across the drive. Eric, who lives down the block from me, came through at 12:45 and widened the sidewalk all the way. He also blew out more of the driveway apron, specifically at the street where there was a small lip from the plow. As I was finishing the front walk, the mailman came by. He thanked me for shoveling a path when he handed me my mail. "Neither snow nor rain..."
And you'll be wanting to know how I feel. At 1:30, I was quite sore. I'd felt okay, great even, when shoveling. I know to lift with my legs and not my back, but my knees and hips are areas where the RA is. It was painful so I took another nap after taking some aspirin. I need to go to bed at a decent time tonight so make sure I allow for some tossing until I get comfortable. So, I have survived the snowy start to 2014. I'm good with snow now. It doesn't have to deposit any of this on us for the rest of the winter. I'm good with this much. It can gradually melt over the next couple of months and then, in March, be completely gone. The neighborhood kids have had a great time helping shovel and being pulled around yards on sleds. The street isn't as clear as one would like but these guys have been at it since 1:30 p.m. on New Year's Eve. There's a lot of overtime in this storm. In another irony, the word of the day today is "graupel".